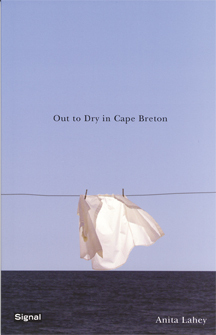 In the autumn of 2005, Dad and I were driving the back road to Main-à-dieu, his Cape Breton village. Just beyond Little Lorraine, a pretty cove sprinkled with immaculate houses, he turned down a dirt road. “Just a little detour,” he said. It was a road a city-trained eye like mine would easily have missed. Tire tracks leading into the bush. Puddle-pocked gravel. Branches scraped the sides of the jostling car. The already dim day—fog, rain, the usual—darkened. After several long moments, the trees fell away. Dead ahead, a broad cove, butting against a large bog. A blue house sat back from the road, a white one on a rise. I glimpsed swatches of ocean through the mist. This, Dad said, was Baleine (1). Though I’d visited Main-à-dieu dozens of times, I’d never seen this nearby village of six or so houses, or even known of its existence. It was boggy and bleak and breathtaking—remarkable for being there at all. As we drove closer, I was further surprised to see a tall flagpole bearing the maple leaf. Dad stopped the car. 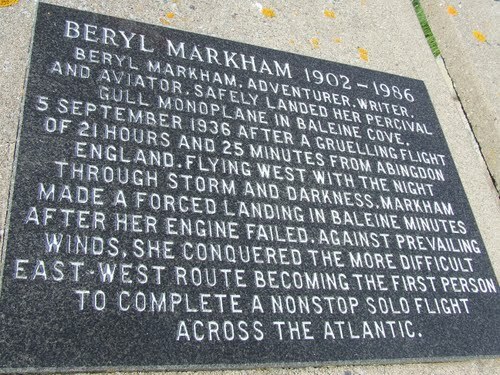 We stepped out into the autumn rain and read a bronze plaque that told how, on September 5, 1936, the aviatrix Beryl Markham ended the first-ever solo flight by a woman (the second by anyone) from the U.K. to North America—against prevailing winds—by landing right here in this bog. I had a sensation reminiscent of childhood: of being granted sudden, unexpected knowledge. How had this never come up before? More likely the place and its long-ago claim to fame had simply crossed his mind as we were driving by—but it was as if Dad had purposely held this (and what else?) back so he would still have the power to astonish me well into adulthood. I turned and stared into the white sky over the steely water. Imagine a woman in a plane falling out of that murk. Imagine such a thing happening decades ago, before transatlantic flight was an everyday occurrence, before 24-hour news cycles and all the rest. Would this have seemed like a dream, like some miracle or terrible omen, to the fisherman who found Markham wandering the bog with a gash in her head? Or would it have been nothing remarkable to a people accustomed to the occasional shipwreck and various other surprises washing up onshore? 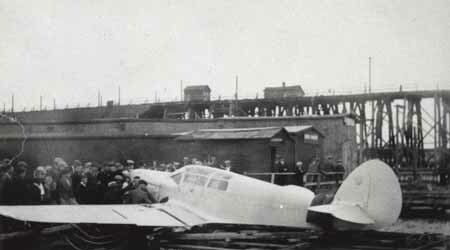 Later, I read a news clipping shellacked on wood at the local museum, and learned that Markham’s engine had been choked by ice, and that she was ferried to Louisbourg, where she spent the night with a local family. What an unusual evening that must have been for all concerned. I tried to imagine it, but it did not seem real to me. Nor did Markham herself. Who dreams such a feat, and then pulls it off? Recently, I read Markham’s 1942 memoir, West With the Night, a used copy of which I’ve owned for years and which I was compelled to finally slide off the shelf because it’s mentioned by a character in Heather Jessup’s lovely novel The Lightning Field. (Does anyone else ever feel that fictional characters are running their lives in this way?) I’ve moved that book from house to apartment to house, hesitant to delve in, wary, I think, of shattering the mysterious aura surrounding this woman. I needn’t have worried. 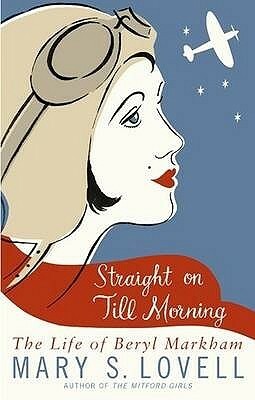 In the memoir, we learn of Markham’s childhood days hunting with Nandi boys in Kenya; her survival of a lion attack; her success training racehorses; her early flights delivering mail and supplies through uncharted African territories; and her daring journey across the Atlantic. Review that list. Lion attacks? Childhood hunting in the African bush? A young female horse trainer in 1930s Kenya? All this, before the cockpit even enters into it. The tyranny of clocks. How did that get in there? It is brilliant, the mark of a master. 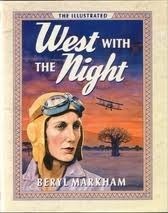 West With the Night is unlike many of the memoirs we encounter today. It is not about overcoming some personal tragedy, and is no tell-all. You won’t learn from Markham’s memoir that her mother essentially abandoned her (leaving her with her father in Kenya) at the age of four. Nor that she worked her way through three marriages and several notorious affairs—and that she is a mother herself. Nor how she felt navigating her way through two male-dominated careers: horse trainer and pilot. She keeps us at a distance, in a way that feels more polite than we are used to, more reserved, and that leaves the contemporary reader—me, that is—bothered by (I admit sometimes unseemly) questions. Such as: could Markham possibly have spent so much time in the African bush with fellow pilot Bror Blixen—just them and the thick vegetation and the threat of becoming prey to any manner of wild beasts—without a single thing going on between them? Answer: of course not. That Markham carried on with Blixen (husband of Karen Blixen, a.k.a. Isak Dinesen, author of Out of Africa) is well known. But you won’t learn of this in her book. You won’t even glean a hint, though “Blix” is a colourful recurring character, and she even writes of being a guest at the Blixens’ home. I found it sometimes intriguing, sometimes irritating, to know how much was going unsaid between the lines. Has my sensibility been sullied by our confessional culture? Or was Markham being coy? On the one hand, there is a dignity in how this book avoids rehashing personal traumas. Her affairs and family history are none of my business, and were extraneous to her purpose. On the other hand, I closed the book feeling that Markham was as surreal and untouchable as ever. The town, the sunrise and the ship were isolated from each other by clouds that had no edges and refused to roll. They lay on the earth like sadness come to rest; they clung to people like burial clothes, white and premature. Blix found them gay. (1) Pronounced “baw-leen” (speaking of which, Main-à-dieu is “man-ah-doo” and Louisbourg is “lewz-burg”). I am a journalist, poet, assistant series editor for Best Canadian Poetry in English, and a former editor of Arc Poetry Magazine.